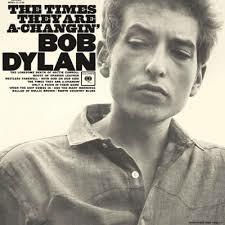 Released fifty years ago this month (January 13, 1964), The Times They Are A-Changin’ marks the end of the second phase of Dylan’s career. His first phase, the Woody Guthrie acolyte who sings traditional folk songs, carried him through 1962. The second phase, the great writer and singer of topical and political songs, made him a star, but was also incredibly short-lived. After this album, Dylan only very rarely recorded the kind of directly political songs about injustice that can be heard here (“Hurricane”, is an extremely notable 1970s version of a song like “The Lonesome Death of Hattie Carroll”). By mid-1964 Dylan would move in an entirely new direction, marking the third period of his very young career. The Times They Are A-Changin’ came into this project as one of my favourite of his albums, and that hasn’t changed. As a teenager, I listened to Dylan over and over in the basement of my parents’ house while playing pool. We had a turntable there and a pair of speakers. This is the album that I played to death, and I can probably still sing most of these songs by heart. I hate to say it but the teenaged me liked the militant Dylan – and I probably would have been one of the people booing him in 1965. The album was recorded in August and October 1963, combining several songs that Dylan had been playing live for a while with some all new compositions. The album (his first to contain only his own songs) has a large number of ballads, and very little humour. It is as dour as the black and white photo of him that graces its cover. Perhaps not surprisingly, the songs that have survived the longest are also some of the least topical and the least tied to their moment. The album opens with the eponymous title track, a song that was deliberately written to be an anthem of its time – now it gets played over the montage that opens every single documentary about the legacy of the 1960s. It’s still a great song, no matter what the filmmakers have done to it. “Ballad of Hollis Brown” had been around a while, and is a darkly grim tale of despair: “There’s seven people dead on a South Dakota farm…”. “One Too Many Mornings” is another great song, though this arrangement doesn’t particularly show it – Dylan retooled it later on to make a better live version. “North Country Blues” is actually a really good song about outsourcing and the economic decline of mining, but he never really used it (his website indicates that it was played live only twice). “Boots of Spanish Leather” has persisted as one of the best folk songs that he ever wrote, and “Lonesome Death of Hattie Carroll” is, by far, the best topical song of his career. Interestingly, Times marked the conclusion of a lot of these songs. Dylan played “With God on Our Side” for the first at the Town Hall show, but he rarely played it subsequently (only thirty times in his career), and “Only a Pawn in Their Game”, which he played at the March on Washington” he only played nine times live. Times continues a run where Dylan ended his albums with pretty weak material. “Restless Farewell” was added late. Dylan recorded nine takes of this at the last session for the album on Halloween 1963. Robert Shelton sees the song as a direct response to the unfavourable Newsweek article about him. Dylan only played it live twice – it seems that classic songs are rarely written as angry responses to Newsweek. Here’s “Restless Farewell” from the CBC show Quest in 1964.